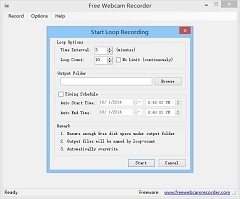 Free Webcam Recorder is a free webcam recording software, it can help you to easily capture and record your webcam video, save video as standalone files, let you view later or share with your friends or family. 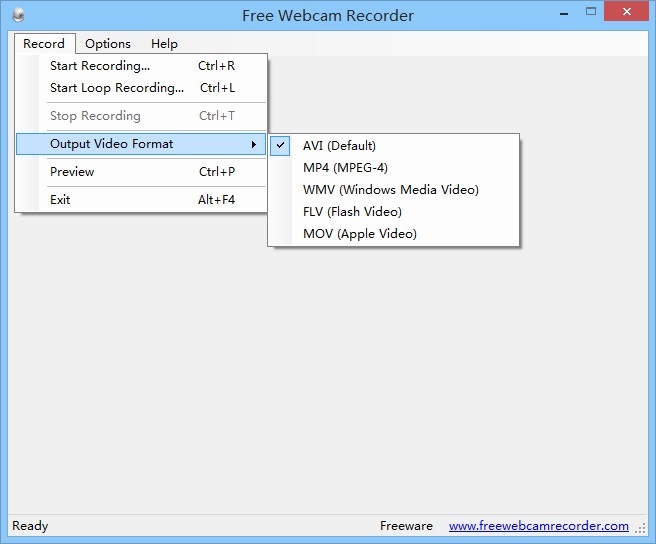 Moreover, software can convert recorded video (AVI) to many popular video formats, such as MP4, WMV, FLV or MOV video. This software is very user friendly and easy to use. 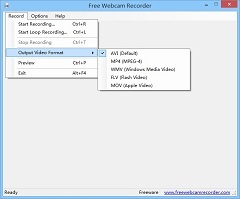 After software launch, it will automatically detect and recognize all webcams installed in your PC, the first device will be selected, software will display its video, let you preview it. 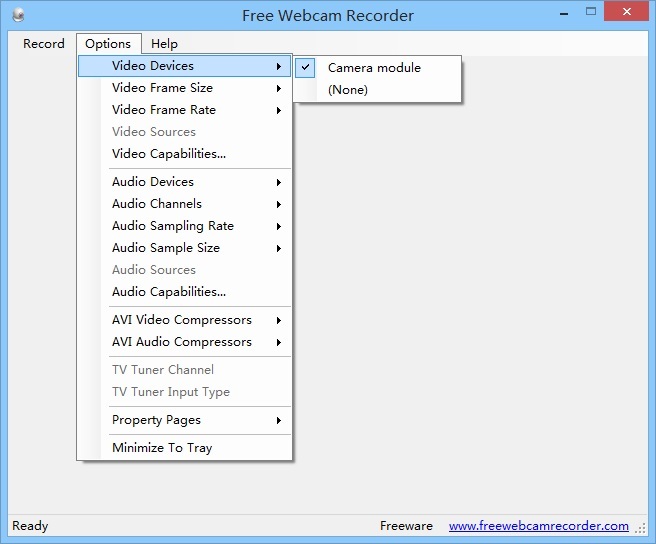 If you have several webcams, using menu "Options" - "Video Devices", you active another video device. If you don't select any video devices, video device is be set as "None", the output files will have no video, only sound. Generally, the default input audio device is the microphone of your PC, other audio input devices can be selected by using menu "Options" - "Audio Devices". If you don't select any audio devices, audio device is be set as "None", the output files have no sound, silent, only video content. For AVI output format, software can support DirectShow Filters: AVI Video Compressors and AVI Audio Compressors, will list all valid filters supported by DirectX on your PC. Other supported options includes: TV Tuner Channel, TV Tuner Input Type, Property Pages and Minimize To Tray. 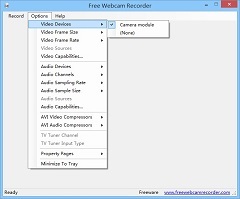 Software supports two video recording modes: Normal Mode and Loop Recording Mode (automatic loop). (1) Normal Mode, this is default mode, manually, record video to one file each time, select menu "Record" - "Start Recording" or hit shortcut "Ctrl + R" to start, software will display a elapsed time in status bar and the upper left corner of interface. You can select menu "Record" - "Stop Recording" or hit shortcut "Ctrl + T" to stop recording. (2) Loop Recording Mode, automatic loop, you can start this mode by using menu "Record" - "Stop Loop Recording" or shortcut "Ctrl + L". 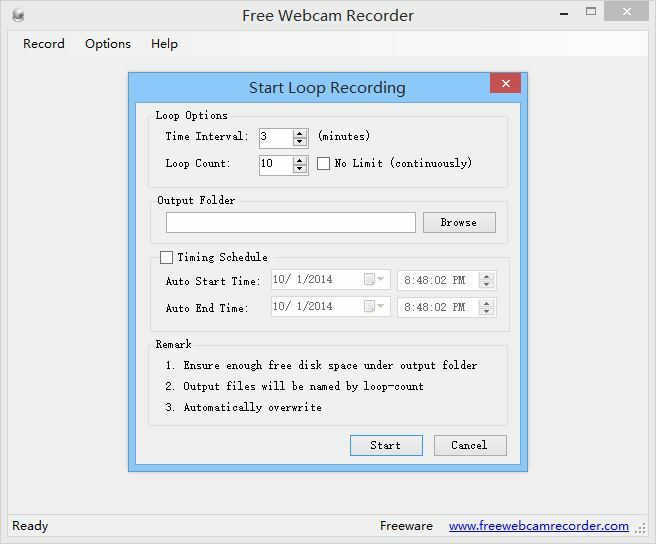 In loop mode, you can record camera video content for a long time, that is, you can use this software as a video surveillance software. in "Start Loop Recording" dialog box, you can customize recoding settings to meet your own needs. Stop loop recording: menu "Record" - "Stop Recording" or shortcut "Ctrl + T". After you select loop recording, software will display a option dialog. (1) Time Interval, you can set a interval for each recording time, its unit is minute, default value is 3 minute, currently, the supported maximum value is 600 minutes (10 hours). (2) Loop Count, default value is 10, which is maintained up to 10 video files, if count reached this number, software will automatically overwrite previous recorded videos. In addition, you set loop count as "No Limit", that means the previous recorded videos will not be overwritten, video recording will always continue until your hard drive is full. (3) Timing Schedule, software allows you to schedule your video recording, you can set the start time and the end time, before start recording, software will automatically wait until the start time, Once the time to the start time, software will start recording immediately. When time is up (reach the end time), software will automatically stop recording. The AVI format is default, other formats include MP4 (MPEG-4), WMV (Windows Media Video), FLV (Flash Video) and MOV (Apple Video). If you use default AVI format, no temporary files, but the result files are generally larger; If you choose other video formats, such as MP4 format, software will record video data to a temporary file, when recording is completed, software will convert it. Please note, in loop recording mode, video conversion process will be completed in background by a thread, so the foreground video recording will not be interrupted. (1) This is a completely freeware, free to use. (2) Software is for Windows OS platforms, .Net Framework 4.0 or later is required. (3) Software should can work with almost popular camera devices, for example: Logitech Webcam, Microsoft Webcam, Creative Webcam and more. (4) Using quick storage device as output, such as HDD (Hard Disk Drive) or SSD (Solid State Drive). (5) If you want to play video on your mobile or PAD, please use MP4 as the output video format. Copyrights © 2014 www.freewebcamrecorder.com, All Rights Reserved.